Factoring is a process of splitting the algebraic expressions into factors that can be multiplied. Included here are factoring worksheets to factorize linear expressions, quadratic expressions, monomials, binomials and polynomials using a variety of methods like grouping, synthetic division and box method. 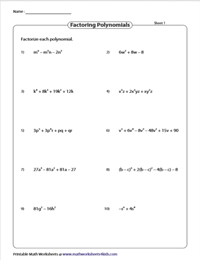 These factoring polynomials worksheets with answer keys offer high-school students immense practice. 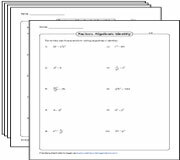 These two-part worksheets encompass ten monomials each. 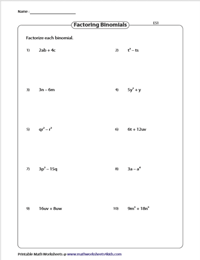 Choose the factors of the monomials in the multiple response questions in Part A and list out all possible factors of the given monomial in Part B.
Familiarize students with the topic by employing these factoring linear expression worksheets. Figure out the common factor of each linear expression and express in factor form. A quadratic expression involves a squared term, in ax2+bx+c format. 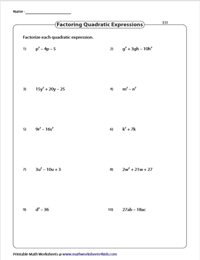 Factor each second degree polynomial into two first degree polynomials in these factoring quadratic expression worksheets. Determine the factors of the individual terms and then track down the common factor to factorize the given binomial expressions. Worksheets are available in two levels of difficulties. When a polynomial expression involves four terms with no common factors, then grouping method comes handy. Organize the terms and then factorize the polynomials by applying the grouping method. This stack of factorize using synthetic division method worksheets provides an alternate way to factorize the polynomials. Also, determine if the given expression is a factor of the polynomial. 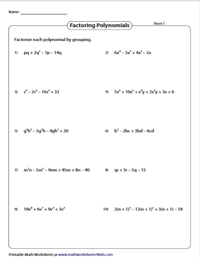 Employ these printable worksheets on factoring polynomials to intensify your practice. 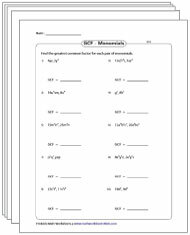 Recapitulate and test comprehension with these worksheets consisting of ten unique polynomial expressions. The box method is an alternative to the grouping method. It makes factoring trinomials easier by dividing the process into simpler steps. Arrange the terms in the 2x2 boxes and get factoring! 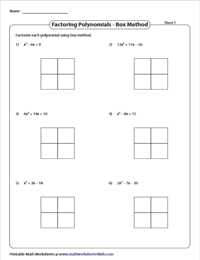 These factorization worksheets involving algebraic identities feature exercises on factorization of algebraic expressions using identities like (a+b)2, (a-b)2, algebraic identities involving substitution method and more! 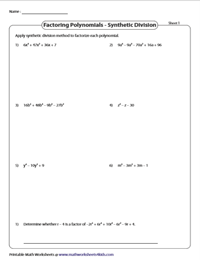 Walk through these Greatest Common Factor of polynomials worksheets to find the GCF of two or three monomials, find the GCF of polynomials, available in easy and moderate levels, find the GCF using the division method and more! 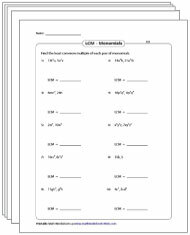 Implement these LCM of polynomials worksheets to hone your skills in finding the LCM of two, three monomials and polynomials categorized into different levels. Find the other polynomial in linear, quadratic expression and more.